On each episode of the NJTV series Pasta & Politics, host Nick Acocella invites a New Jersey political giant into the kitchen to talk politics and cook a meal together. Former Governor Christie Whitman and Acocella prepare a vegetarian tricolore fusilli with peas and herbs on the December 8 program. Here’s the make-it-yourself takeaway! 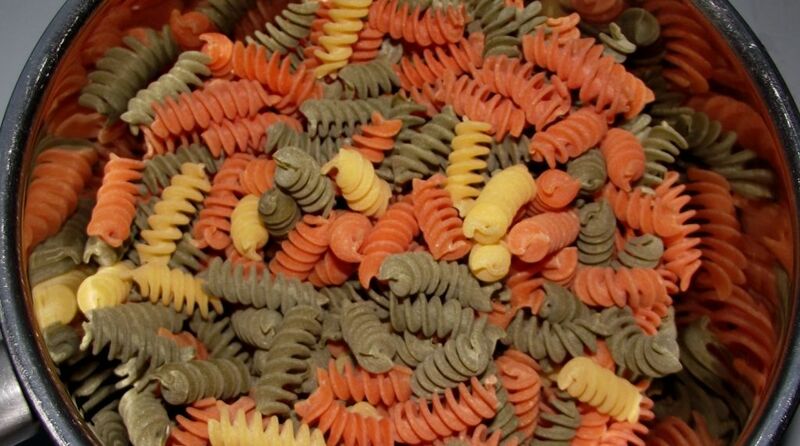 Tricolore Fusilli after boiling. Photo by Rillke. Tear the basil and sage into small pieces. Cook the fusilli in a pot until it is al dente (firm, not soggy!). Drain the pasta. While fusilli is going, brown the garlic in enough olive oil to cover an iron skillet. Add the peas to skillet and allow to cook until they soften. Don’t let them get mushy. Add the basil, sage, and chives to the skillet. Add the zest of half a lemon. Toss the pasta with the peas and herbs. Grate Peccorino Pomano cheese onto the pasta. Sprinkle parsley over the plated dish as a garnish.